The last time my wife and I went to Disneyland, around a dozen years ago, navigating the sprawling Southern California theme parked involved grabbing a paper map at the entrance, noting the attractions we wanted to see, and then walking in the general direction of each of those rides. When we came upon a busy ride—anything with a line of, say, over an hour—we debated whether it made sense to wait the wait right then, or to come back later…knowing full well that the next ride we walked to might have an even longer line. When it was time to eat, we stepped into the nearest restaurant; if nothing on the menu tickled our fancy—or if it was too pricey for our budget—we moved on to the next one, and then the next one, and so on. Sometimes we’d visit five or six restaurants before deciding that the first one was actually the best option. That’s probably a familiar scenario to anyone who’s been to a major amusement park. On a busy day, you might wind up enjoying six or seven rides (if you’re lucky) and spending quite a bit of money on food you don’t even particularly like. Today’s amusement park experience, however, is quite different from what I went through 12 years ago. And the iPhone is a major reason why. From planning your trip to finding your way from Adventureland to Tomorrowland, a number of iOS apps can help you squeeze every last minute of enjoyment out of a trip to the Magic Kingdom. I discovered as much the other week when my family—which includes two young children this time around—visited Disneyland armed with an iPhone and a few relevant apps. Although its map is cluttered and cartoonish, Walkee is a great tool for planning which attractions you want to visit—and checking them off once you've seen them. Before we even left for the trip, we used the $4 Disneyland iGuide - Walkee to decide which attractions we wanted to see and ride. Although the app’s interface is a bit cluttered, Walkee is a great way to plan your day—or days—at the Magic Kingdom. 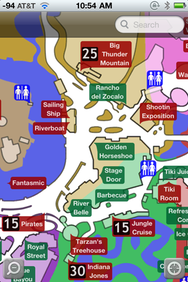 Its map shows an icon for each attraction; a tap on an icon shows that attraction’s name. Tap the more-info arrow, and you see a brief description of the attraction and its history; for rides, this screen also inclues a Tummy Tester advisory (for those with weak stomachs), any height requirements, the length of the ride, and a section on typical wait times for the ride (based on historical data). There’s also a Schedule feature that shows hours, events, and closures for the days you’ll be at the park. Using this information, you can mark as favorites each of those things you want to see or ride. The app was also useful for helping us figure out which rides would be appropriate for our toddler and which ones should probably wait until the kids are older. For example, at first glance, the Snow White ride seemed like a good option, but the description noted that it’s a bit scary for small children. What’s especially useful is that Walkee lets you customize its map to display only the info you want to see. We opted to show favorites, character meets, and restrooms; once we got to the park, we could easily see which attractions we wanted to visit without being distracted by everything else on the map. (I wish the app provided an option to remove items from the map once I marked them as completed, however.) We also knew where to go for the kids to take photos with Disney characters, and where to quickly find the nearest restroom—which, as any parent with small children can tell you, was a welcome option, as kids at Disneyland have a tendency to claim they don’t need to use the facilities until about 30 seconds before it’s too late. My biggest complaint about Walkee was that its map, while pretty, is cartoonish and not great for actually navigating the park. And while the app can give you almost-live updates of ride wait times, the interface for this feature isn’t very helpful: You can see all wait times in a single list, sorted alphabetically, or you can tap a ride on the main map to view just that ride’s wait time. Disneyland Maps’ map is more useful for actually navigating the park, and the wait times proved to be quite accurate. A better park-navigation option is the $2 Disneyland Maps (also available in a free-with-ads version). This app provides a detailed, accurate map of the park; zoom in, and you see every attraction (in red), restaurant (in green), and restroom. But unlike Walkee, Disneyland Maps displays the name of each attraction and restaurant. Tapping an item displays a photo of it, and a More Info button gives you a quick description, although you won’t find nearly as much info in this app as you will in Walkee. The best feature in Disneyland Maps is that its excellent map also displays nearly-live wait times for every applicable ride without having to go to a different screen. As with every other wait-time app, the times in Disneyland Maps aren’t sanctioned by Disney, but I found them to be accurate within five or ten minutes, which made the wait-times feature indispensable during our visit. A casual glance at my iPhone’s screen showed us which nearby rides had the shortest waits, and let us avoid the most-popular rides until their lines got shorter. (If an estimate is dramatically off, you can submit your actual wait time to improve the app’s accuracy.) Thanks to the app, we never waited more than 15 minutes for a ride, and we made it onto many rides in under five minutes. Both Walkee and Disneyland Maps are GPS-enabled, so you can quickly see exactly where you are in the park. We never had to wonder where, exactly, we were or how to get to a particular attraction. Disneyland Dining’s distances were obviously wrong, but the relative positions were accurate—the closest restaurants were at the top (left). 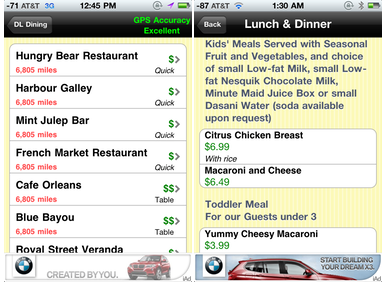 You can even view the full menu for each restaurant (right). The final app that made our visit better was the free (ad-supported) Disneyland Dining, which shows a list of all park restaurants, sorted either alphabetically or—more useful—by distance from your current location. Tap any restaurant and you get a quick description, a photo, and a list of the restaurant’s vitals: the price range, whether it’s quick or sit-down, whether reservations are needed, and the type of food (American, Cajun-Creole, Italian, and so on). Best of all, you can view each restaurant’s complete menu, including prices. For a family with small children, this proved invaluable. Wherever we were in the park, we could stop and browse the menus of every nearby restaurant, making it easy to find a nearby eatery—or a couple close to each other—with reasonably-priced offerings to satisfy everyone. Over two days, we avoided half a dozen restaurant-hopping episodes thanks to the app. Disneyland Dining also lets you mark particular restaurants as favorites and then restrict the list to just those places. If a restaurant requires reservations, or if you plan to meet up with others at a particular time, you can enter that information (including reservation number) and then view your entire dining schedule on a single screen. You can also call Disney’s dining-reservation line directly from the app. The main goal of my recent Disneyland trip was to spend time with my family, not test a slew of iPhone apps. Nevertheless, a quick search of the App Store will turn up a lot of offerings geared toward visits to Disney’s assorted theme parks, and a few of these apps have tickled the fancy of other Macworld reviewers. UPinPoint.com has a mobile box set of maps for the assorted Disney World parks that’s won rave reviews; the developer’s Disneyland California Mini Guide contains maps of both Disneyland and the California Adventure park, and it won’t cost you a dime. 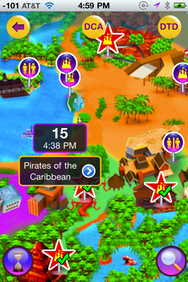 Likewise, our reviewers have praised TimeStream Software’s mobile Walt Disney World Guide for the Florida theme parks; the developer also offers a version for Disneyland. As I mentioned above, I found Disneyland Maps’ wait times feature perfectly suited to my family’s needs. But the free Disneyland MouseWait Social Wait Times app received a glowing assessment from one of Macworld’s reviewers, though personally, the app’s a little too difficult to navigate for my tastes and it lacks a map of the park. Still, it does give you access to some good info, and you can sort the wait-times list by time. If you’re a fan of the Toy Story Mania game—and my colleague Philip Michaels insists you should be—you can unlock what Disney bills as a “special surprise” if you fire up the app at the Toy Story Mania attraction in the California Adventure park. Of course, using these apps meant I had my iPhone in my hand, or within easy reach, most of our visit. (Which, sadly, meant I fit right in with all the folks texting and checking e-mail while they walked around, while they waited in line, or even while on the rides—appropriately enough for Southern California, people were even talking on their phones while driving the Autopia cars.) But thanks to my iPhone, in the approximately 13 hours we were in the park, we were able to enjoy 31 rides. Even during low season, 10 rides in an eight-hour day is often considered outstanding. For my family, this was a prime example of how a handheld computer with a live Internet connection and some clever apps can add to the family vacation, rather than take away from it. After planning our visit and navigating the park using iPhone apps, we’ll never go back to the “old fashioned” way. While some might bemoan the technological approach, with Disneyland ticket prices getting ever higher—it cost us $220 per day, and that was with free admission for our toddler—I welcome any way to get more bang for my buck. And our kids had a blast, going on ride after short-line ride. In fact, nothing we saw in Tomorrowland held a candle to the “We’re in the future!” feeling we got from our app-enhanced experience in the Magic Kingdom.